Crisp on the outside and tender and buttery on the inside, this 4-Ingredient Baked Salmon Recipe is the easiest and most delicious way to prepare a healthy dinner! Place salmon in a greased 9 x 13-inch baking dish or on a parchment-lined rimmed baking sheet. Pat salmon dry with paper towels and season liberally with salt and pepper. Brush soy sauce all over the fish, and allow to sit and marinate at room temperature for about 15 minutes. Bake salmon, uncovered, for 7 minutes. 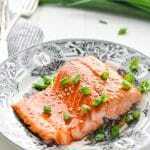 While salmon is in the oven, whisk together honey and maple syrup in a small bowl. After 7 minutes, remove salmon from oven. Baste with honey mixture. Return salmon to oven and continue baking for 7-9 more minutes, or until fish flakes easily with a fork. Garnish with green onions and toasted sesame seeds, if desired.